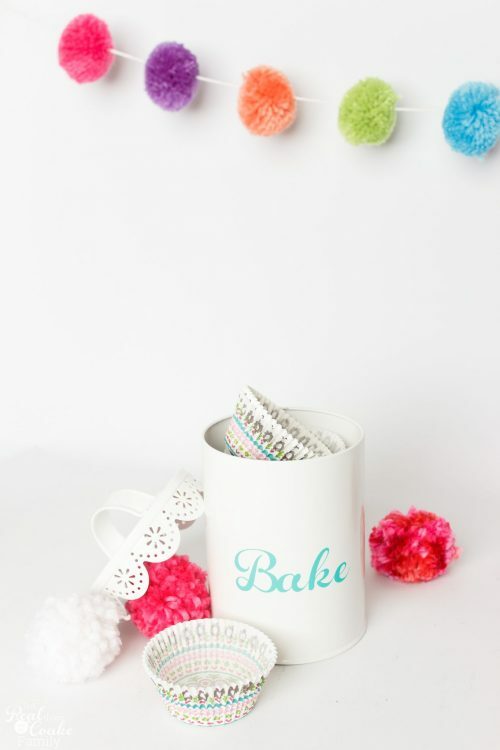 I've got the cutest DIY organization idea for you today! It is also a super easy craft. What could be better? 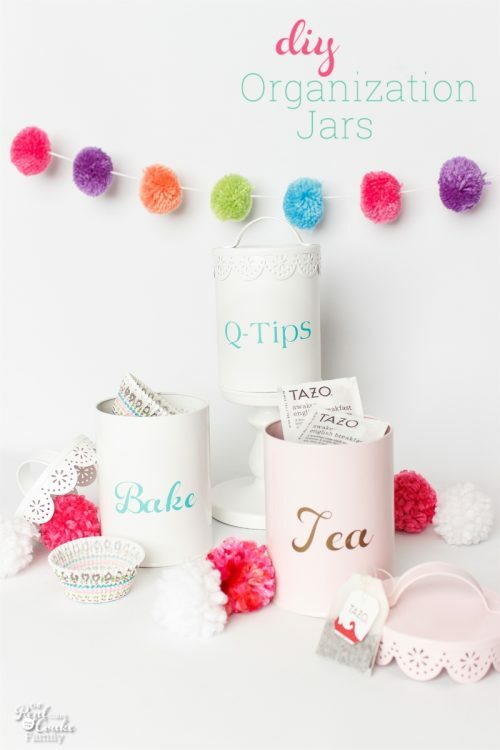 Putting together a craft and some organization = perfection! I found these adorable little canisters at the dollar spot at Target. I looked at them and admired them multiple times but I had no idea what I could use them for, so I left them there. Finally one day, upon seeing that they had light pink (not just red and white), I decided that a few of them must come home with me. AND at the same time inspiration hit me. Yay! 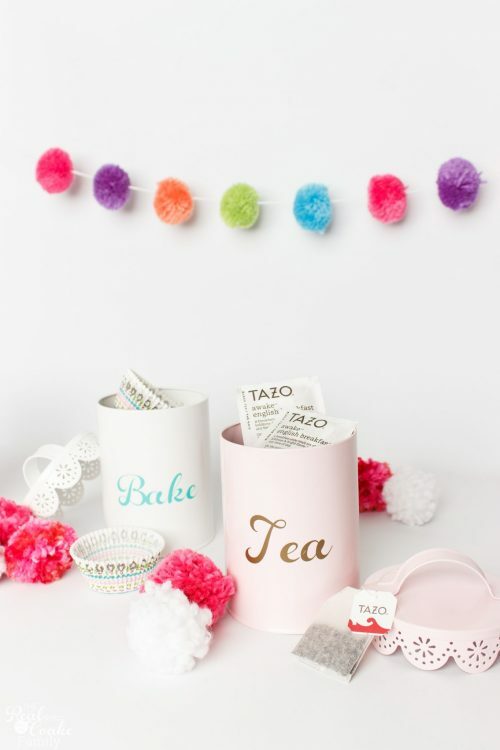 I started with the canisters which are totally adorable in their own right, but I wanted to add a little something to them to make them even better for organization. 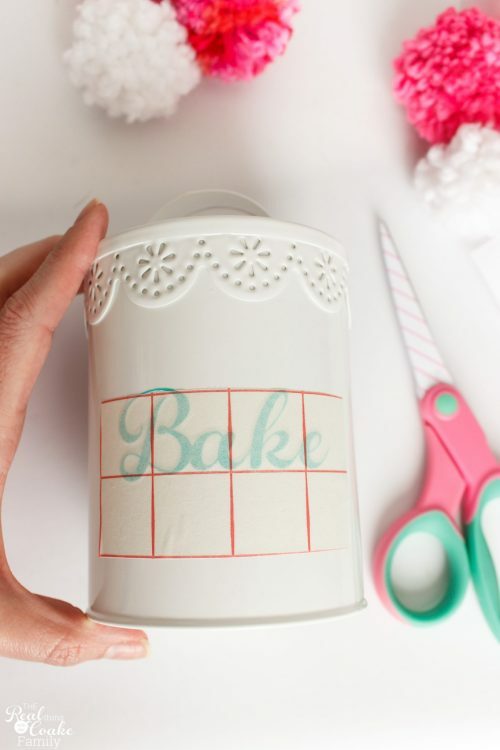 I hooked up my Cricut and decided on the wording for the outside of these canisters. I have the Cricut Explore Air (affiliate link) and it has a dial that all I have to do is set it to the type of material I am using and presto it cuts it perfectly. So easy! I had a stash of adhesive vinyl from when I personalized my youngest daughter's IKEA dresser. The hardest part was deciding what to store in my canisters and what wording to use. My oldest daughter things that the wording ‘bake' is just weird. Oh well! Once you have your wording decided upon and cut out, you will need to weed your vinyl. That just means to get rid of all the extra pieces that you don't want to apply to your canisters. 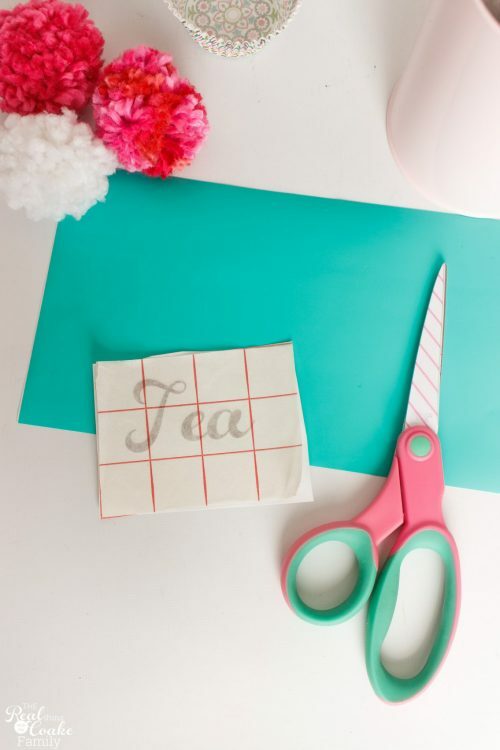 Next up, you will want to cut a piece of transfer paper (affiliate link) that matches the size of your wording. Apply the transfer paper to your vinyl. Personally, I prefer transfer paper with grid lines. It makes it a lot easier to know if you are applying your vinyl straight and level. Carefully, add your vinyl to your canister. 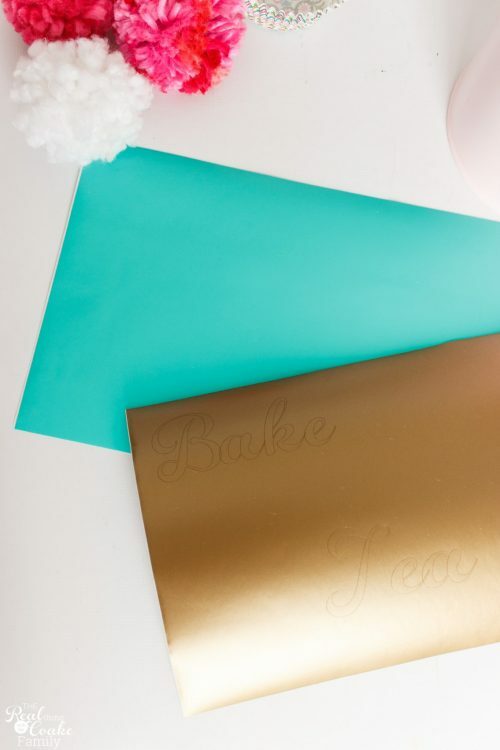 You will want to do your best to get things straight on the first take because once the vinyl and transfer paper are down, it is hard to adjust things. That is why I like the grid lines. In the case above, I could apply the lower portion of the sticky transfer paper to the canister first and make sure it was straight. Then I could smooth down the rest and be pretty confident I was straight and level. Press your wording down. Rub it smoth and rub out any air pockets if needed. Finally, remove your transfer paper. 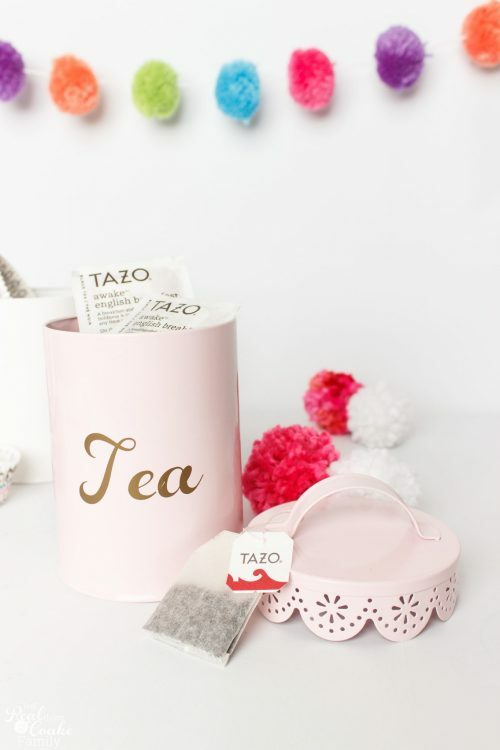 I mean, could there be a more cute DIY organization idea?! 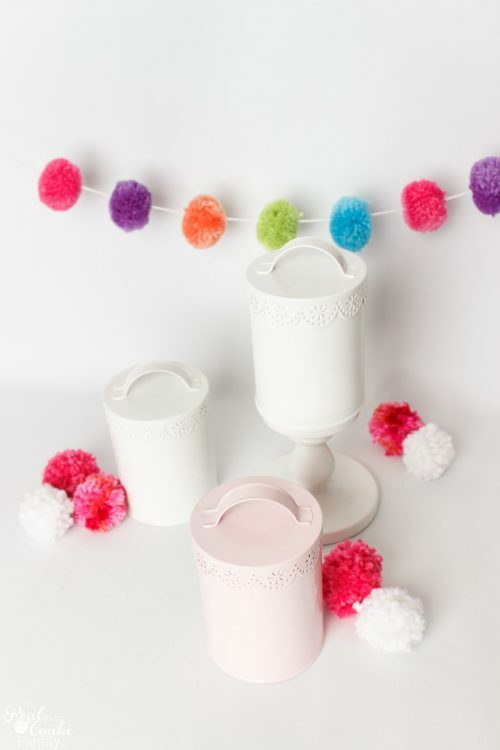 I love the little cut-out details in the lids of these canisters and that they provide super cute organization. Nothing better in my book! Now, to keep it real, I did these up to show you guys before the canisters are all gone from the Target dollar spot. I haven't actually decided what I'm really going to store in mine. 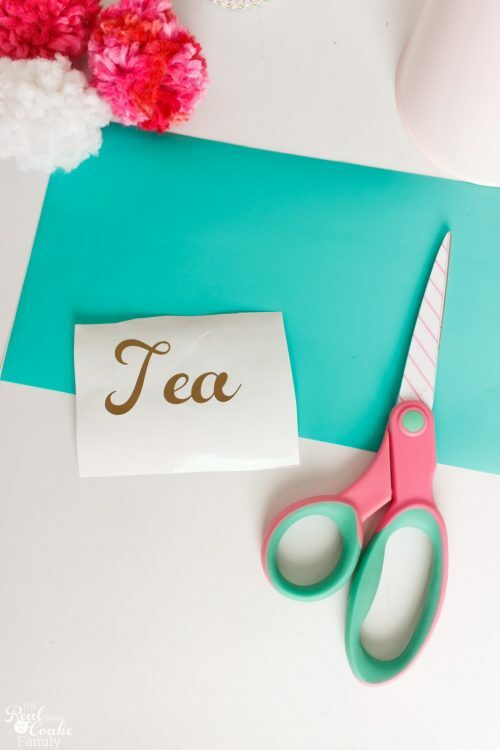 I know I'm going to find just the perfect use for them with some upcoming organization project around my house but until then….I will leave you with a cute idea. I will also tell you that it is best not to buy supplies when you have no project for them or immediate use for them. It will just lead to clutter. I rarely, if ever, do this….but they were so cute I couldn't let them go. What would you use this DIY organization idea to organize? Leave me a comment below. I would use these to organize office supplies. I am a sucker for pens and highlighters – I LOVE them and have way too many! But I’m always looking for cute containers to keep them in because I like having them within reach because I really do use them. Thanks for sharing at Over the Moon. We look forward to seeing you next week too. That is a great idea! Not only would it hold your great collection of pens and highlighters (among other fun office supplies), they would look so cute! Fun! These are so cute! And they’d be great for organizing all kinds of smaller things. I’d probably use them for washi tape or craft supplies, or cupcake papers like you did! Thanks for linking up with Merry Monday; I’m featuring your project in my round-up for this week’s party, which goes live tonight! Thanks! Yes, they would be great for all the ideas you had. Fun! With 2 teen daughters, I can think of many organizing uses for these pretty containers. Congrats, you’re featured this week at the #ThisIsHowWeRoll Link Party. I know, I think the possibilities are endless! Thanks so much for the feature!